TonerGreen Eco-Friendly HP Q2612A (HP 12A) Toner Cartridge for HP LaserJet 1012 | TonerGreen - Eco-Friendly Toners from the U.S.
TonerGreen is an online provider of eco-friendly toner cartridges and eco-friendly ink cartridges for major printer manufacturers such as Hewlett-Packard. We offer a wide selection of eco-friendly remanufactured HP toner cartridges are expertly built by our professional technicans to make sure that they can meet the standards set by the printing industry. TonerGreen helps you cut down your HP printer supply costs by offering remanufactured laser printer toner cartridges compatible with HP printer models. With TonerGreen products, you can save as much as 60% and help save our planet at the same time. Our in-house manufacturing facility ensures that our remanufactured HP toner cartridges are of excellent quality to match OEM standards. 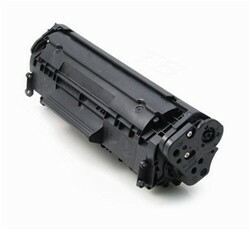 One of TonerGreen best-selling eco-friendly HP toner cartridges is the HP Q2612A (HP 12A) black laser toner cartridge. Our HP Q2612A Toner Cartridge is Eco-Friendly! Remanufactured with up to 75% recycled components, our HP Q2612A Toner Cartridge is thoroughly engineered to meet or exceed OEM specifications. All our ink and toner cartridges are backed by 100% Risk-Free Guarantee. Features: Made in the USA. 2-Year Warranty. Experience ultimate Eco-Value when you purchase our remanufactured HP Q2612A Toner Cartridge: practical environmental solution, world-class service, and the highest quality Toner Cartridge at the most competitive price.